According to so many errands, I am still away from Bangkok executing many tasks, from legals, housing, and etc. It is not too bad because every trip I made elsewhere it was filled up with new discovery of which, given me a lot of great pleasures. The place where I am staying now is right in the middle of Chiang Mai's Nimman Rd. There are many nice boutique hotels around but I preferred only few of those, according to price and worthiness. This time I stay at one of my favourite again, and they have almost everything I will need such as great hotel amenities, services, coffee and great breakfast. Today I had this Croissant, which is complimentary from hotel (usually cost THB 270 or more here and elsewhere). The croissant was made from one of well known bakery in Chiang Mai, but the rest of these were composed by hotel's baristas. (not just one, but every barista seems to be well equipped, and can serve more than one task.) 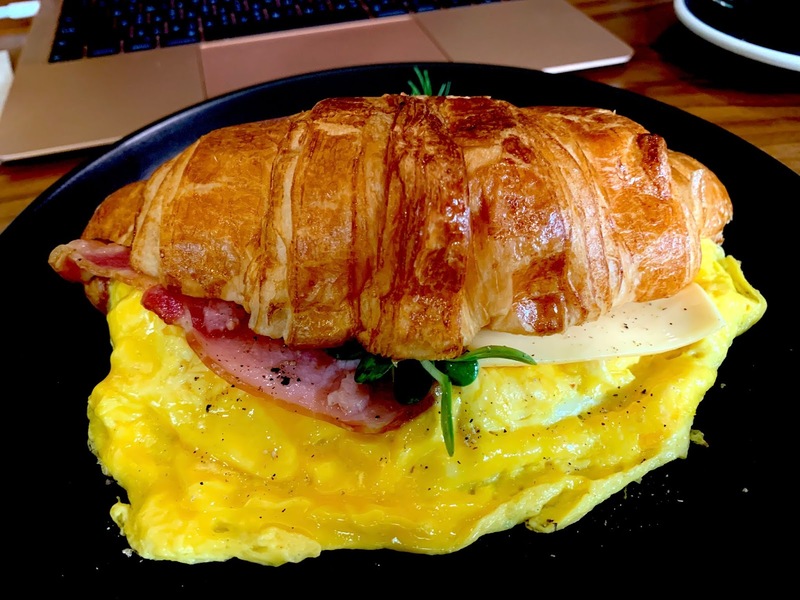 Anyway, the croissant is filled with scrambled eggs, and english bacon. I really enjoy it. Not every hotel can come up to match this with this kind of price. Chiang Mai is now entering Low Season, and if you can stand the heat, please do so because of cheaper price. Song Kran (Thai New Year) is coming soon, and will be packed, but if you can get here between now and then or after festival, it is one of the best city of be. (minus Air Pollution which is really the worst in the world).